On Sunday March 24, 2013 Dr. Martin Porter, a pioneer of the Unification Movement in the West, passed away at his home in New Paltz, NY. Dr. Porter is survived by his sons Tim and Lucas and by his daughter Hanida. His wife Marion is already waiting for him in the spirit world. Arrangements for a memorial service for Dr. Porter are in process for Saturday morning, March 30, 2013 in Dobbs Ferry, New York. Dr. Porter was born in Hampshire, England, in 1942 and met our church in Rome in 1965. He was blessed in marriage by our True Parents in Europe in 1969 as part of the 43 Couples Blessing that was celebrated in Essen Germany, Washington, D.C. and in Tokyo within the span of a few weeks. 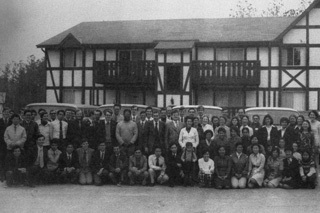 One of the earliest members of the church in Europe, Dr. Porter served for many years as an early President of the Unification Church in Italy, from 1967 to 1977. In 1973, he moved to the United States to do evangelical work, including leading a One World Crusade Team in 1973 to 1974.. Subsequently, Dr. Porter served as the President of the Canadian Church from June 1, 1977 to Aug. 31, 1983. He later was asked to lead a shipbuilding enterprise, Master Marine and IOE Fishing Operations in Bayou la Batre, Alabama. Raised an Anglican, Dr. Porter, discovered early in life that he had psychic gifts and remembers receiving direct communications from Jesus. In his testimony published in 2010 (Tribute: Reflections from the Early Years, HSA-UWC, 2011) he wrote that: “I had some very clear visions which took place in clear daylight while I was wide-awake. During my first experience I had with Jesus in St Mary's Church, Woodbridge [Suffolk, England] I was kneeling in a pew in prayer and at a certain point I looked up and looked at the east window (in front of me) and saw Jesus’ face covering the whole end of the transept. It was a very warm, peaceful, embracing, life-giving meeting. As a young adult, Dr. Porter was interested in visual communications and spent some years travelling in Europe and the Middle East compiling a portfolio of documentary photographs. In 1961 he enrolled at the University of Florence to study sociology and later attended a film school in Rome. According to his testimony, while producing a documentary on a hospital for child victims of polio, he became deeply affected by the hopelessness and suffering of the children and could not help wondering who was responsible for such suffering; God or man. He had not been attending church regularly when a friend invited him to an evening of lectures about "a new revelation by a Korean visionary." At an apartment in Rome, he met Ms. Doris Walder (later blessed in marriage to Dennis Orme) and Marion Dougherty (to whom Dr. Porter was blessed after his marriage in 1969 had failed). Dr. Porter was profoundly moved by Doris Walder’s lectures on the life course of Jesus, and he began a three day fast to pray about it. “Encouraged by the idea that God can forgive if we repent, I did pray and repent just as if my life depended on it. I knew if I made a total commitment in prayer answers would come, I had experienced that many times in the past. God answered my prayer. I felt something I had not experienced before. For the first time I felt God's personal love for me as a forgiving parent, even though I had not gone in His direction at all for such a long time. I felt He, the great almighty God, had been looking for me, going out of his way for me, and so I had a lot of repenting to do. “These thoughts brought me to a most humble state of heart. I felt He really cared about me as an individual. Until this moment it was my understanding that God would love certain people because of their accomplishments, but why did he love me? I had done nothing that I recognized as being of great value for God, others or even myself. But from this experience I realized He loves us because He is our parent, and He knows what we are capable of and we have a unique position in his plan. I was truly born again and I felt peace and worth as I had never felt before. Mrs. Christel Werner, a pioneer of Unificationism in Germany, fondly recalls her many experiences with Martin and his late wife, Marion: “He was a dear and very capable brother to us all for many years and always took his mission very seriously, wherever he was sent by True Parents. True Father actually switched our missions in 1983. We were sent to Canada from Bayou La Batre, Alabama, where we developed the shipbuilding and seafood operation from 1977 - 1983, and Martin and his wonderful wife Marion were sent to Alabama from Canada to take over. by Douglas Burton in New York and Franco Famularo in Montreal.